The New York Jets have long lived as fodder for division rival New England Patriots. Gang Green hasn’t finished ahead of the Pats in the AFC East since 2002. The Jets made improvements this offseason, namely adding running back Le’Veon Bell and linebacker C.J. Mosley. The biggest upgrade New York can imagine, however, is seeing quarterback Sam Darnold make a leap in Year 2. 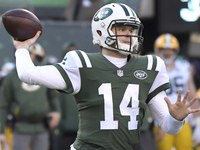 "I’m just going to go out and do my best," Darnold said when asked about finally surpassing the Patriots, via Manish Mehta of the NY Daily News. "I feel like literally in my lifetime, the Patriots have ended up on top. So, I’m just going to go out there and do my job. I’m never counting anyone out, honestly. Not just the Patriots, but every team that we play in the league." Darnold’s guesstimation of the Pats’ dominance over the division is close. Since the 21-year-old exited his mother’s womb on June 5, 1997, the Patriots have won 17 division titles, including 10 straight. If we assume Darnold wasn’t sports-conscious until 2001 at the earliest, his recollection of the Pats always being on top is even more accurate. From 2001 to present, New England has won 16 of a possible 18 AFC East titles. They finished second the other two times and have never had a record worse than 9-7 (2002) since Bill Belichick’s first season in 2000. Darnold isn’t getting ahead of himself. He knows it will take strides for the Jets to first get out of the division cellar, after three straight seasons with five or fewer wins. "I’m just going to go out there every single game and every single snap, do my job, and play to the best of my ability," Darnold said. "I know it sounds clichéd, but it’s true. You got to do it. Every single play here in the NFL. And if you don’t, you’re going to get beat." The Jets’ best chance to avoid getting beat each week is Darnold becoming the consistent franchise signal-caller that he showed flashes of last year. If Darnold finally provides Gang Green with their best quarterback since Joe Namath, perhaps one day the Jets will finally fly past the Patriots. One day. NFL midterms: Most exciting player? Top rookie? Best trade?